Under the current administration, the federal government is turning its back on its responsibility to ensure that all Americans breathe clean air and drink clean water. Donald Trump and his cronies are backtracking on ensuring a clean energy economy that provides green jobs to make our communities sustainable, and they are instead working to benefit corporations by allowing them to further poison our air and water—in turn hurting families and communities. 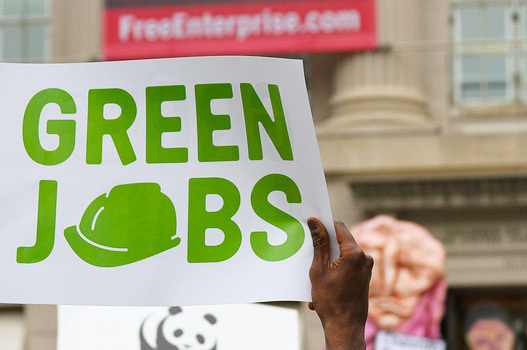 But here is the good news: The future of clean green jobs is no longer with the federal government. Consider that more than 1,000 mayors in U.S. cities have signed up to reduce their cities’ carbon emissions and 18 states are already set to meet their goals for reducing carbon emissions. Locally, community groups are leading the way with some of the most robust and creative efforts to make their neighborhoods sustainable. For example, communities in South Los Angeles and Washington D.C. have been hard at work creating good paying green union jobs and training programs focused on hiring unemployed community members to be successful in these new jobs. In Los Angeles, Strategic Concepts in Organizing and Policy Education (SCOPE) is a social justice group that represents the predominantly Black and brown residents of South LA, where one in every three people are unemployed or underemployed. Faced with such dismal statistics, SCOPE, local advocacy group LAANE and the electricians’ union International Brotherhood of Electrical Workers Local 18 formed a coalition of more than 40 L.A. groups made up of environmentalists and workforce development, labor, and youth groups. The coalition, called Repower LA, pushes the city’s Department of Water and Power to install or require the installation of energy efficient systems like toilets and faucet aerators that use less water or light fixtures and bulbs that use less electricity in homes, small businesses, and schools. So far, thousands of units and developments have received these free installations, lowering utility bills. Meanwhile, the effort has created a demand resulting in hundreds of new jobs at the utility for people to install the systems. Unemployed residents undergo training and receive the proper certifications to fill these new jobs, ultimately earning a living wage and health benefits that help them and their families succeed. This effort was not a first for SCOPE. A few years before, the organization worked with the city, local union chapters, environmentalists, and community groups to establish an initiative that put in “green” retrofits in more than 50 city buildings. A training program for unemployed residents to do the work underpinned this effort. On the other side of the country, the Washington Interfaith Network (WIN) in D.C. has worked relentlessly to ensure that residents train for and have access to new jobs that were created to improve the district’s water quality. In D.C., a court settlement found that during heavy rains, the city’s sewer and water system discharged untreated storm water and wastewater into river and streams, causing toxic pollution. Residents affiliated with WIN demanded more investment in cleaning up the waterways and pushed the city to guarantee that at least 51 percent of local residents train for the jobs required for the cleanup. The group also successfully pushed for green infrastructure solutions to the storm water run-off problems that include using permeable pavement, rain garden and wetlands construction, and green roofs to steer toxic runoff away from the city’s water supply. These voices, and thousands more, made themselves heard on April 29, when Americans of all stripes joined the People’s Climate Movement to march in Washington D.C., and in satellite marches across the country. More than 800 organizations across the country are working together to rid our air and water of worsening pollution, while also creating solutions that create good jobs in our communities. We all share a vision that protects our families and the places we call home. On April 29 and beyond, the communities most impacted by climate change in the U.S. lead the way to solutions that matter. Elsa Barboza is a senior organizer at the Center for Community Change, where she leads efforts to create clean energy jobs for low-income communities of color nationwide.